I’ve had a hankering for barbecue. Tracy’s travels took him through Memphis last week where they were holding the Memphis in May World Championship Barbecue Contest. I was real close to dropping everything and heading there for the weekend. Instead we decided to fire up the grill at home. His and Her BBQ Ribs. His on the left and Hers on the right. My vision included a St. Louis style sweet and spicy peach BBQ sauce while Tracy was dreaming of a spicy Kansas City style dry rub. We decided to compromise with one rack of ribs for each style - His and Her BBQ Ribs. His and Her BBQ Ribs on the grill. His on top rack. Hers on bottom rack. Pick up 2 slabs of baby back ribs and prepare each to his or her taste. This recipe slow roasts the ribs for a few hours in the oven. Then you have the option of finishing off on the grill or under a broiler. It's up to you. Preheat oven to 250 degrees F. Line large baking pan with aluminum foil. Her Ribs Prep: Brush slab of pork ribs with olive oil and generously sprinkle with salt, pepper and some cayenne pepper to suit your taste. Place on roasting pan along with His BBQ Ribs. 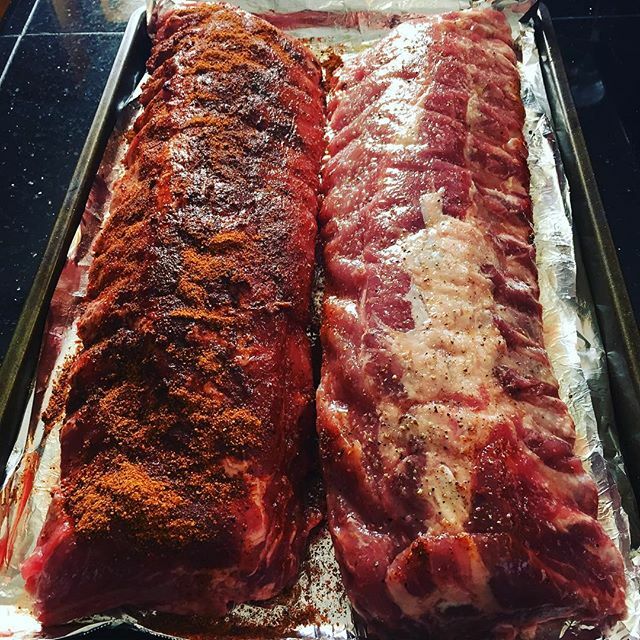 His Ribs Prep: Sprinkle and coat ribs with McCormicks Grill Mates Pork Rub or seasonings of your choice. Place on roasting pan next to Her BBQ Ribs. Place pan in oven and roast low and slow for about 2-½ hours. Remove from oven and baste Her BBQ Ribs with Sweet & Spicy Peach BBQ Sauce. Place pan with both racks of ribs back in oven and cook for additional 45 minutes or until done. Set aside until ready to finish on grill or in oven under broiler. To Finish on Grill: If grilling, heat grill to high. Add ribs and adjust heat as needed.Grill ribs for about 45 minutes. Baste with your choice of BBQ sauce. To Finish in Oven: Preheat broiler for 5 minutes or so. Baste with BBQ sauce as desired and broil ribs for about 5 minutes on each side. Ribs should begin to crisp and char. Remove when done. Serve with the BBQ sauce side of your choice. Enjoy! This sauce is spicy sweet deliciousness and great on pork or chicken. My favorites are pork baby back ribs and chicken wings and thighs. Wrap the bacon around the fresh thyme sprigs and secure with kitchen twine/string. Heat olive oil in a large saucepan on medium heat. Cook the bacon thyme bundle till bacon is brown - about 4-5 minutes. Add chopped onion and garlic and saute till transparent - about 5 minutes. Stir in remaining ingredients, heat through and reduce heat to low. Simmer with cover on pot, stirring occasionally for about 30 minutes. Remove bacon thyme bundle. If you’re using same day, put some in separate bowl to baste meat as needed. Reserve the rest to serve with meal. Otherwise, let cool and pour in a mason jar. Refrigerate and use as needed.